Heat oil in a large heavy-bottomed pot or dutch oven over medium-high heat. Dredge beef in flour and brown a few pieces at a time. Transfer meat to a plate and set aside. Add onion to the pot; cook a few minutes and then add the garlic. Continue to cook until vegetables are soft. Stir in sugar, red wine vinegar, herbs and salt. Return beef to the pan along with the beer and beef stock. Increase heat to high. Stir to combine ingredients, scraping the bottom of the pot to loosen the delicious browned bits. Bring to a boil. Reduce heat to low, cover with a tight-fitting lid. Cook about 2 hours or until the meat is very tender. During the last 30 minutes of cooking time, prepare the dumpling batter. 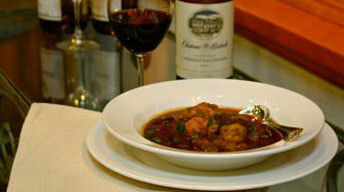 When stew is done, drop the dough into the simmering stew with a tablespoon. Cover and continue simmering about 20 minutes without removing the lid, until dumplings are cooked through. In large bowl combine flour, salt, baking powder and parsley. Cut the shortening into the flour with two knives or a pastry cutter until it resembles coarse meal. Stir in milk with a fork until the dough just holds together.